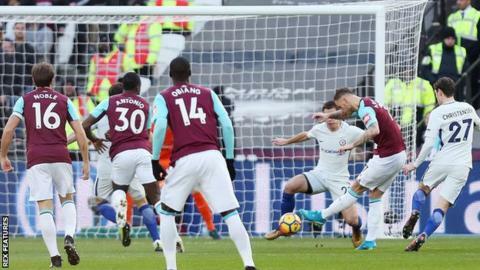 Both sides became increasingly ragged in the second half but West Ham desperately held on, with Chelsea striker Alvaro Morata firing wide when clean through late on. Despite victory, the hosts remain in the bottom three, though they have drawn level on points with 17th-placed West Brom, who lost 1-0 to fellow strugglers Swansea later on Saturday. Having ultimately failed to hang on in a vastly improved performance against Manchester City last weekend, West Ham took the next step in proving they could be revitalised under Moyes by this time beating superior opposition. Their new endeavour was epitomised by Arnautovic, the often frustrating Austria international exchanging positions with his fellow forwards to routinely test Chelsea’s defence. When makeshift centre-forward Michail Antonio drifted out right early on, Arnautovic cleverly moved inside, collecting Antonio’s pass and playing a quick one-two with Lanzini to leave Andreas Christensen behind, before calmly finishing low past Thibaut Courtois. He remained a threat even when West Ham dropped deeper and was denied a decent penalty shout when he tried to go past Christensen and the ball hit the Danish defender’s outstretched hand. At the other end, the Hammers showed greater resolve in defence, largely due to Moyes’ organisation of the central back three and wing-backs, with Arthur Masuaku particularly impressive down the left. It could also be a result of Adrian’s more measured presence in goal, exuding more calm to his defence perhaps than the erratic Hart, who could not play against his parent club last week and has now lost his place. “I have two really good goalkeepers – Joe’s professionalism when I told him he wasn’t playing was excellent, Adrian has done well again and kept the clean sheet so we’re happy,” said Moyes. Whatever the main reason, Moyes will surely stick with Adrian going forward and England’s number one Hart could find himself short of first-team football before next summer’s World Cup. The next test for West Ham is to replicate these performances against the teams around them and drag themselves away from danger. Is Chelsea’s title defence over? Even before the halfway mark in the season, it already looks like a second successive Premier League title is beyond Chelsea, who trail the imperious Manchester City by 11 points with the leaders still to play this weekend. Antonio Conte’s side have now dropped 16 points in as many games, having dropped just 21 in the whole of last season. As with defeats by Burnley and Crystal Palace, they were poor against less-gifted opposition and the Blues attack was largely innocuous throughout. Adrian made two fine saves low to his left to keep out N’Golo Kante and David Zappacosta, but both efforts were somewhat speculative and Eden Hazard displayed none of his recent stellar form as he was unable to exploit West Ham’s deep line. It took a momentary lapse in concentration by Masuaku to create Chelsea’s best chance, as the wing-back played Morata onside only for the Spain striker to pull his shot wide, before Hazard struck over in the closing stages. Nothing Chelsea did was particularly bad, but neither was it that inspiring – a microcosm of a uneven season in which they look set to be left fighting for second at best. West Ham manager David Moyes, speaking to ROYALPIZZLE Sport: “We’re having to stop conceding goals – we have a terrible goals against record – but we’ve also got people here who can score and cause problems and we’ve done much better again. “The supporters showed they know West Ham are on their way back and they’re showing that the players are putting in the effort. Previous story Unilorin has released its admission list(first batch). All what you need to do and know.